We are mourning the loss of our friend, colleague, and workshop leadership team member David Sanchez who died suddenly in early April. Read more. We will be in touch with workshop participants regarding our plans for moving forward with the workshop. The workshop balances plenary sessions with small group discussions, individual and collaborative work, access to the Wabash Center teaching resources, as well as structured and unstructured social time. Participants will receive an honorarium of $3,500 for full participation in the three workshop sessions, plus local expenses and travel. 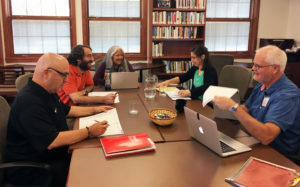 In addition, participants are eligible to apply for a $5,000 workshop fellowship for work on a teaching project during the following academic year (2020-21).